Review Context: The only game I’ve played that closely resembles this even remotely is FTL: Faster Than Light, as it’s another game that involves managing ship crew and ship systems. Reality TV has a major presence in the entertainment industry, but what if a video game combined reality TV elements with ship combat? That’s where Bow to Blood: Last Captain Standing comes in, a single player rogue-like game that involves airship combat, set in a deadly reality TV show. You are The Freelancer, a captain challenging other ruthless captains, battling in series of matches to become the Bow to Blood Champion. When discussing Bow to Blood: Last Captain Standing it needs to be separated between discussing the airship combat portion of the game and reality TV portion, with both providing different experiences and frustrations. Given that this is a rogue-like game, each “run” is called a “season,” which consists of seven matches, with each match consisting of an opening and closing event, followed by “The Culling.” The Culling is where the last two score captains on the scoreboard face a vote and a captain is voted off. 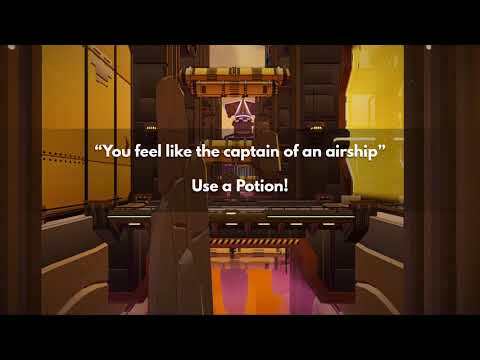 Upon starting your first season run you go through a tutorial explaining on the various controls and customization options you can activate within your airship. In Bow to Blood you do feel like you are a captain of a ship, as you have to command two people to various ship systems, whether it be shields, weapons, boost, sensors, or drones. It is up to you to pick where to station your ship workers, including shifting resources to certain systems to make them stronger in certain situations. This part of the game definitely resembles FTL: Faster Than Light, another 2D rogue-like ship game, It’s important to note that Bow to Blood originally released as a VR game. Unfortunately, this bears out in the gameplay because the ship is very difficult to maneuver, always bumping into side wall objects. The matches within a season consist of you, The Freelancer, trying to outscore the other captains in shooting down enemies from The Overseers in the match arena. There are also treasures around the map that can be obtain to increase your score total. Each match also has different objectives, with opening event of the match making you find a warp key, followed by the closing event. The closing event can be anything from finding specific treasures, to trying to get the last hit on a big enemy. The level arenas within the matches are relatively ugly, hard to move your ship around in some spots, but most of all it doesn’t really feel like an arena. The match levels have the appearance of a vast open-world, only to discover a wall boundary when moving too far out. All that being said, the levels are colorful, but the enemies are all relatively the same and hard to distinguish because the colors only seem to be the different factor. While engaging in combat, managing the systems and having to shoot does feel cumbersome, as there are so many things to worry about, plus moving your ship. It became more and more clear to me the more I played that the game is probably more enjoyable in VR. The camera is probably the most annoying part because you will have to randomly change between the various camera views during your playthrough and that is incredibly frustrating. The tutorial does a decent job of teaching you the weapon systems, but doing them all once under pressure while trying to around the map is a much different story. That’s not to say Bow to Blood is an unenjoyable or a difficult game, because when you get in a flow of movement and shooting it feels great and the reality TV elements add a lot of spice to an otherwise bland combat experience. Where the game shines the most is the reality TV part of the game, as you will encounter many captains contacting you to make you special offers for alliances that can help change the tide of your survival from getting voted out in The Culling. In my different playthroughs I had totally different experiences, as one captain was an enemy of mine out to kill me compared to another playthrough where we were alliance members working together. What Bow to Blood gets right the best is the reality TV experience of forming alliances, backstabbing, and even throwing in twists to spice up the experience to change the tide of what is happening in the season. 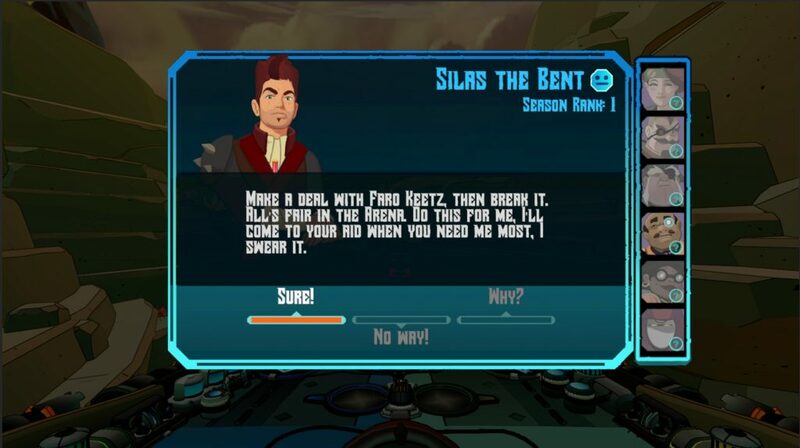 The game does have good menu and icon functions to keep track of all your captain relationships. The one thing that could be fine tuned is that you (The Freelancer) can’t initiate conversational deals with other captains, as you have to wait for a prompt in-between matches to talk to whatever captain that wants to talk to you. During one of my later season playthrough ended up surviving The Culling with a bottom two score because I cut deals with a specific captain in order to get more points, which subsequently also gave me their vote allowing me to stay in a 3-2 vote, the deciding factor. Although most of the time I was in the bottom two of The Culling, I was able to vote at least one of the times and that was fun. In Bow to Blood every decision has a consequence. Other captains may be friends with an enemy of yours potentially causing your downfall, in addition to many decisions involving point trading/sharing. Due to the imbalance of my enjoyment being mostly the reality TV portion, I kept wanting to rush through my matches just to get to make more decisions. Graphically, I’m very impressed with the art style and coloring, but the levels feel like they have a lot of structures just thrown together as obstacle with little care for placement. The portraits of the captains are great, as well as the many graphics and descriptions of all the airship systems. The announcer of the arena is the star, as he has good voice acting and visual presentation for a host of a reality TV show. The sound effects in the game are decent and fit well with the game’s atmosphere, and I can’t forget to mention the airship commentary from your crew that helps give you tips from time to time. Bow to Blood: Last Captain Standing is an interesting game because it struggles and excels at the same time. 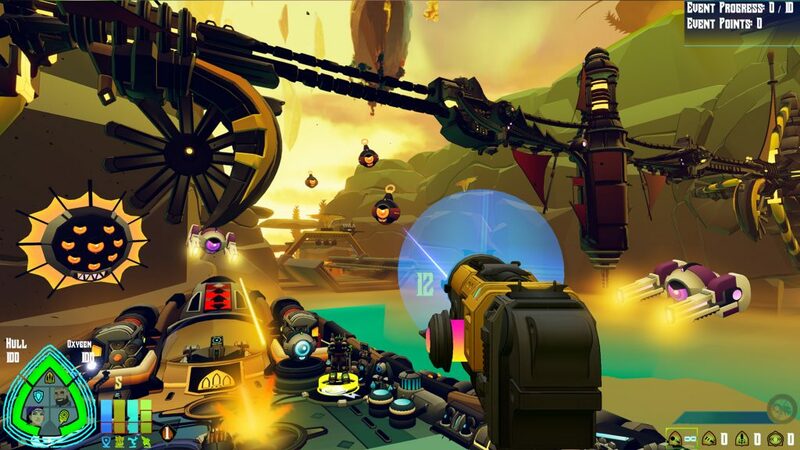 Tribetoy should be commended for combining airship combat with reality TV, as this is a truly unique game in its own right. Tribetoy should also be commended for realizing their own reality, which is that Bow to Blood‘s definitive experience is likely to be in VR, their release in 2018. If the number of matches in a season is cut in half in a future update, then I will wholeheartedly endorse this non-VR experience, but as of now I choose to be agnostic.